Markus Golden has been showing off his talents this week at the Senior Bowl practices against some of the nation's top seniors. Former Missouri defensive end Markus Golden tends to stand out wherever he goes, and Senior Bowl practices have been no different. The impression Golden continues to make on NFL scouts and draft experts goes well beyond his long-flowing locks and commanding voice, which only reinforces his passion for football. Media reports said Golden left his mark in practice against some of the nation’s best seniors, racking up two "sacks" (tacklingquarterbacks is not allowed) and a forced fumble in Wednesday’s practice. "He’s got bighands," says Dan Shonka, general manager and national scout for OurLads.com, who was in Mobile, Ala. this week. "I think teams would like to see him be that 3-4 outside rusher. He showed his explosiveness off the edge, his ability to play with lever age." Those same skills led to 16 1/2 sacks in two seasons at Mizzou, including 10 as a senior opposite SEC Defensive Player of the Year Shane Ray. The league’s coaches named Markus Golden to the All-SEC second team after he finished with 78 tackles, including 20 for loss. He measured out at 6-foot-2 and 1/5 of an inch and 255 pounds, a little smaller than the average defensive end in a 4-3 scheme in the NFL. 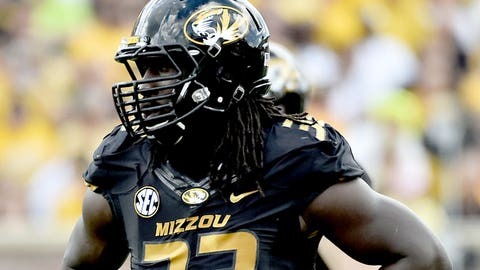 But Golden told the Kansas City Star he can put on weight fast if needed. Some scouts believe Golden’s arm length could be a bit of a concern as well, since he was measured at a shorter-than-expected 31 inches. If teams decide Golden should move to outside linebacker, Shonka says the key will be how well the St. Louis native learns to drop into coverage. Lookin’ good! Check out our gallery of SEC cheerleaders. A solid showing this week will be more important than anything Golden might do in Saturday’s game, if he even gets to play. Reports from Mobile say a groin injury could keep him sidelined, though it’s not believed to be anything serious. Most projections have him going somewhere in the second or third round of this spring’s NFL Draft, though Shonka believes late first round is a possibility. Golden’s next chance to raise his stock will be at the NFL Draft Combine in Indianapolis from Feb. 17-23. Another notable Mizzou senior could get an unexpected opportunity to turn some heads in Saturday’s game, scheduled for 3 p.m. on the NFL Network. Injuries opened up a spot for SEC Special Teams Player of the Year Marcus Murphy on the North team’s roster. He also played last week in the NFLPA Collegiate Bowl, one of the newest All-Star games that featured head coaches Mike Martz and Mike Holmgren, as well as other big names. Although Murphy’s American team lost 17-0, he had the longest play of the day on a 43-yard run in the fourth quarter and also returned a kickoff 24 yards. The draft is shaping up to be a good one for Mizzou, which saw four players selected last year for the first time since 2009.